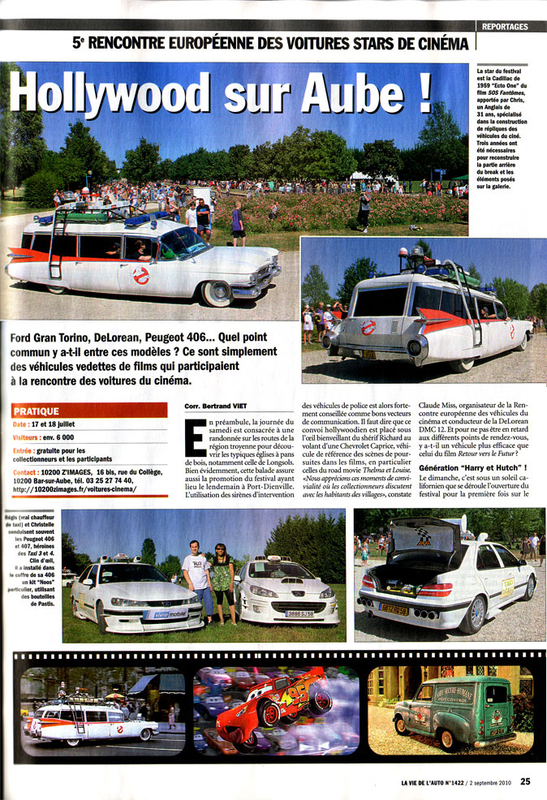 the car | Star Car Central - Famous Movie & TV car news! 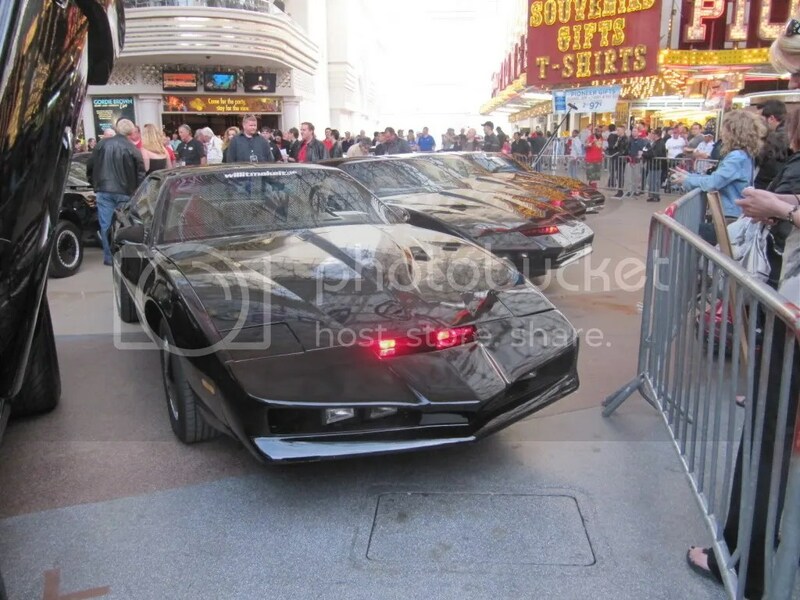 KNIGHT RIDER FEST 3 Brings together fans of KITT and KARR in VEGAS, BABY! 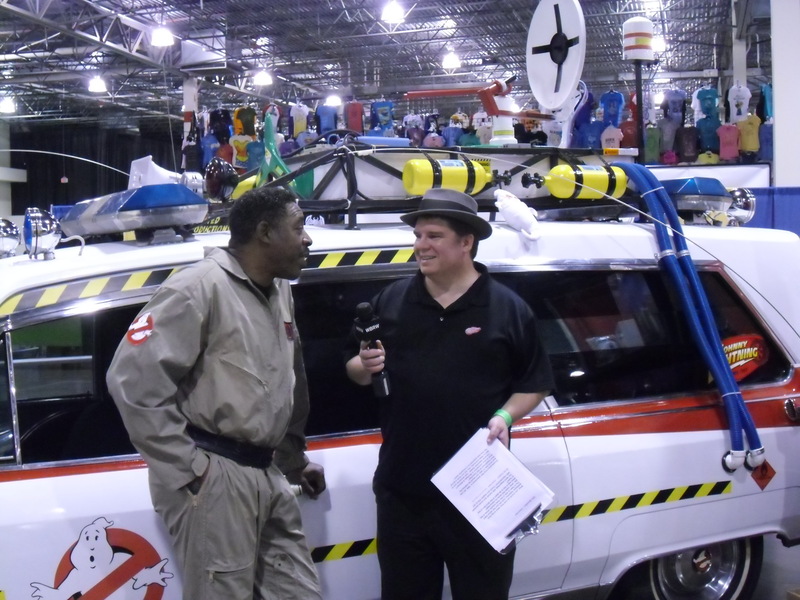 There are fans of TV shows, and fans of the cool cars on the shows, then there are super fans who do something to bring a fan community together! 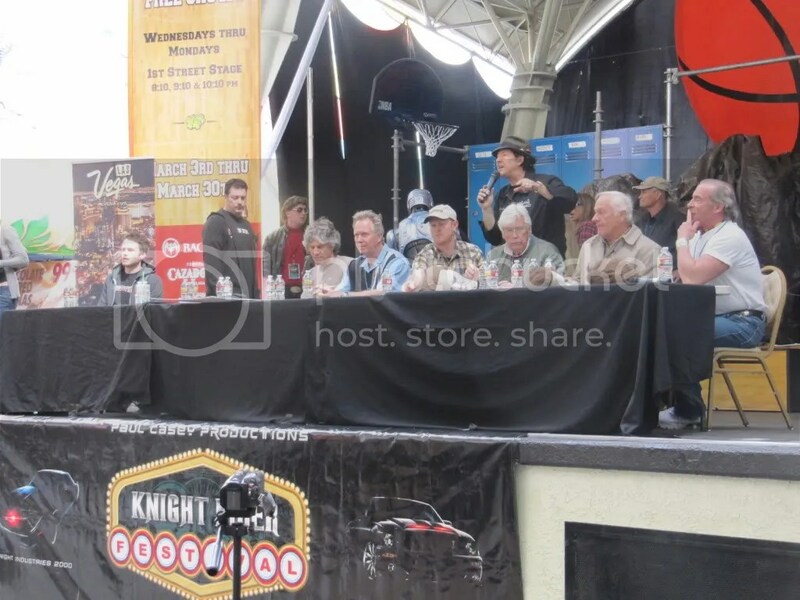 Paul Casey had a dream a few years back of getting rows of Knight Rider cars AKA KITTs (Knight Industries Two Thousand) and KARRs (Knight Automated Roving Robot) as well as cast and crew all in one place for fans of the two Knight Rider Series to get to spend time together. After many hours of detective work and many more hours of phone calls convincing people he was actually going to pull this fan based event together it actually happened! Now in it’s third year Paul has established an annual event for all things Knight Rider! Owners from around the country, and even Canada and beyond have come with their replica and tribute cars to meet the stunt men, creators, and actors at the last three Knight Rider Festivals. David Hasselhoff star of the first show has appeared, as well as Justin Bruener, the star of the more recent “Mustang” based Knight Rider show that followed the continuing adventures of the Foundation of Law and Government that the HOFF worked for in the 80’s. One of my early jobs in Hollywood was being the voice of the KITT at Universal Studios and I joined the speaker panel at the first Festival. Since then representatives from Starcarcentral.com and Knights of the West Coast aka KOTWC have volunteered and brought their talents and cars to every Festival! Dan, Alex, Nick, Jenn, Matthew, Glen, Nate and even Paul with his Back to the Future Delorean have appeared at the event as the Designer of KITT Michael Shiffe, also worked on the Delorean for the back to the future movies! This year there were 16 kitts, 2 karrs, 6 mustang kitts (3 of them were the originals from the tv show). Of the 3 screen used kitts, 2 of them were from the pilot episode, the hero and attack mode, and the other one was the gimble kitt, the one that was at the on the rotating platform at the foundation base. It took many people coming together to make this show a reality and everyone enjoyed getting to know the other owners and cast members and driving down the Las Vegas strip in a parade of 80’s Trans ams with their Knight Rider Red lights flashing! So is Paul ready to do a fourth? He says “YOU BET!” so mark your calendars for Knight Rider Festival FOUR in February 2012! The only way to do this test right was to recruit an actual General Lee for a test. No, not just a ’69 Charger somebody painted orange to look like the General, but an actual survivor from the set of the TV series. That’s right, a General Lee that was actually used in filming the show, authentic from the top of its haphazardly painted roof to the bottom of its correct American Racing Vector wheels. The real thing. Not an easy thing to do. Real General Lees were sacrificed for our entertainment. According to Ben Jones, who played Cooter on The Dukes of Hazzard, as well as builders involved with the show, 256 General Lees were used to film the series. Others claim about 321 were used in the series. Regardless of the number, only a handful remain, and they are big-buck collectors’ items. And so we called Bob Hartwig, a former airline pilot who now works at Cinema Vehicle Services. 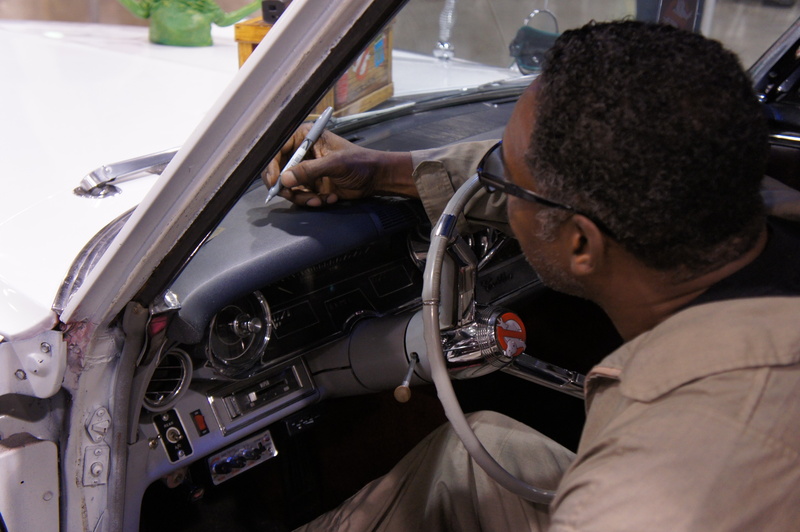 He’s also a collector of movie and television star cars. Hartwig said yes. Jacked up on its rear leaf springs, Hartwig’s General has the attitude we all remember from the series. But get up next to it, and the reality of how Chargers were treated during production of the show is apparent. Hartwig hasn’t restored this car to pristine condition, instead choosing to keep it in as close to the state it was in when filming concluded. There are dents, dings, scratches and enough patina to document this muscle car’s 42 years of hard use, including more than a few drunken dirt road runs after late nights at the Boar’s Nest. In other words, it’s frickin’ beautiful, and it’s here at California Speedway on a cool February morning ready to take on its shiny new grandchild, the 2011 Dodge Charger R/T. It won’t show up in any marketing research, but the reason anyone will buy a new 2011 Dodge Charger is the fantasy that it’s really the General Lee. It’s the dream of sliding across that big orange hood, leaping in through an open window, drifting across dirt roads, eluding Sheriff Roscoe P. Coltrane and jumping a 400-foot-wide creek. It’s the dream of freedom, joy, implausible indestructibility and being a Duke boy in Hazzard County. Actually we’d bet you our last pair of Daisy Dukes that it does show up in the marketing research. But Dodge doesn’t share that with anyone. Of course there have been Chargers other than the General Lee that have given the name some cultural heft. There’s the 1969 Charger Daytona Big Willie Robinson drove around Los Angeles when he was organizing the Brotherhood of Street Racers. There are the Chargers Richard Petty drove to NASCAR championships in 1973 and ’74. And of course there are all the Chargers that have been featured in movies like Bullitt, Dirty Mary Crazy Larry, Blade and most recently Quentin Tarantino’s Death Proof, and that black, blown ’70 Charger that scares Vin Diesel so much in the Fast and Furious movies. The General Lee is America on a 117-inch wheelbase. But despite all that, the Charger that matters most is the General Lee from The Dukes of Hazzard television show that ran on CBS from 1979-’85. It’s the big coupe millions of us grew up watching fly. Millions who have grown up to find themselves smack in the middle of the current Charger sedan’s sales target demographic. According to Hartwig’s estimate, 60 percent of his General Lee’s sloshed-on orange paint is as it was laid on at Warner Bros. The roof’s flag has been replaced, but the “General Lee” lettering above each door is vintage and the “01” graphics on the doors are cracked and fractured. The front bumper is munched, all the plastic pieces show weathering and the interior has been re-dyed. The truth is, back then, the producers of Dukes didn’t see the Chargers they were consuming as collectibles or classics. They were simply disposable props. And they were treated as the throwaways they were. Why waste time trying to get the paint perfect when there’s fresh donuts to be eaten over at the catering truck? However, original doesn’t mean this can didn’t come ready to run. Hartwig has rebuilt the General’s 440-cubic-inch (7.2-liter) Magnum V8 so it runs stronger than its original 375 horsepower. It also fires up with roar, as you’d expect, and settles into an appropriate ’60s muscle car idle, complete with just the right amount of rumpity-rump. And the rest of the drivetrain is in excellent shape, too. Its Torqueflite three-speed automatic and solid rear axle, packing a limited-slip differential and 3.55:1 gears, are a time-tested combination that stood up to anything our test-driver Mike Monticello could dish out. In sum, it’s a General Lee ready for a really big jump! Only this one never got a chance to commit on-screen automotive suicide. Unlike the General Lee, the 2011 Charger R/T drives into California Speedway under its own air-conditioned, computer-controlled power, wearing “Toxic Orange” paint that’s about as close to the General Lee’s color as the factory currently offers. It’s not really that close; in fact, it’s more ’60s psychedelic than late ’70s kitsch, but it’s a blistering shade anyhow. There are substantive mechanical changes to the 2011 Charger, but the most obvious tweaks are stylistic. 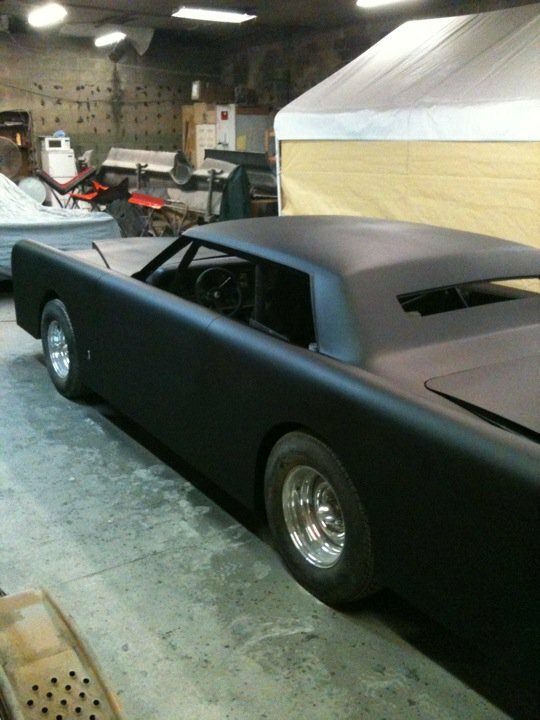 And most of these tweaks are lifted straight off the 1968-’70 Charger. In silhouette, the 2011 Charger isn’t much different from the four-door sedan that first wore the name as a 2006 model. After all, the 2011 Charger still rides on the same Mercedes-derived LX platform as the ’06 car, still rides on the 120.2-inch wheelbase and the greenhouse is more or less carryover. It’s details like the twin depressions in the hood, the scallops carved into the doors and the double-sided hockey-stick taillights that come over directly from the General Lee-generation Charger. And he’s right. They don’t. That, however, doesn’t mean that this latest restyling is unsuccessful. The ’06 car was generic; it could have been an Intrepid, Monaco or Coronet. This one, on the other hand, despite those hideous chrome wheels and that silly rear spoiler, looks more like a Charger should. It’s bolder, more aggressive and polarizing. If you don’t like how this car looks, give it up and go buy a Taurus. Under the new Charger’s hood is the 5.7-liter Hemi V8, which we’ve been praising for years. Now rated at 370 hp at 5,250 rpm and a chunky 395 pound-feet of torque at 4,200 rpm, it features Chrysler’s fuel-saver technology that shuts down four cylinders for better fuel economy when their power isn’t needed. Um, we wouldn’t be using that fuel saver stuff during this test. The new Hemi, like the old Hemi, is a pushrod, overhead-valve engine with an iron block, and it has an eager personality thanks to variable cam timing and a stiff 10.5:1 compression ratio. However, with its contemporaries moving on to six-, seven- or eight-speed automatic transmissions, the Charger R/T’s mandatory five-speed box is antiquated. All-wheel drive is now offered with the R/T package for the first time in 2011, but it makes burnouts and powerslides impossible and should therefore only be purchased by nuns and men named Stacey. 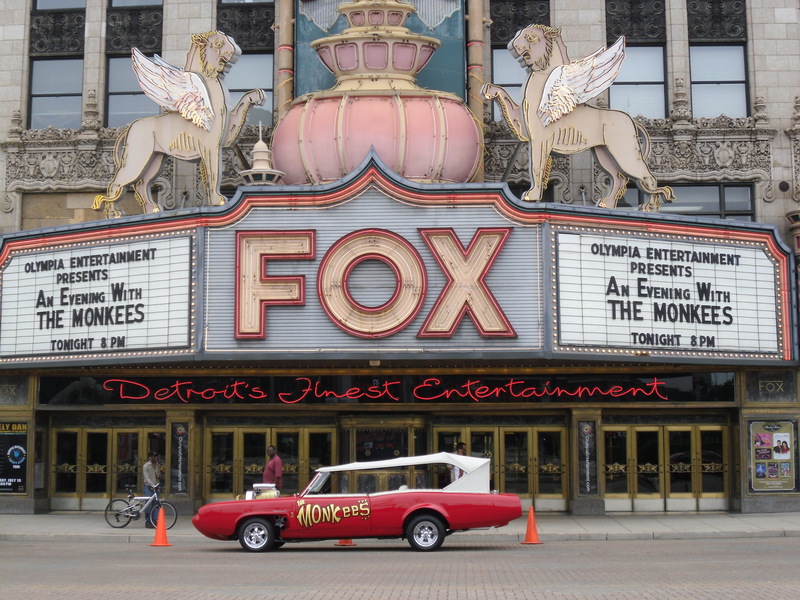 Our orange test car, like the General Lee, was driven by its rear wheels, just as Bo, Luke and Cooter would want it. Get past the orange paint and the Confederate battle flag painted on its roof. The essential element in the General Lee’s massive charisma is that it’s a ’69 Charger. And while that second generation of Charger may not be everybody’s favorite muscle car shape, it’s in everyone’s top 10. Make that top five. Even at 42 years old, the old Charger’s perfectly proportioned shape, sweet details, blunt split nose, tunneled rear window and chrome fuel door are timelessly cool. This is America on a 117-inch wheelbase. Hartwig’s well-aged General Lee, the number registered on its odometer meaningless, did its species proud. The acceleration runs were an exercise in trying to tame wheelspin, but a dab of power braking and a gentle touch had the car ramming its way to 60 mph in 6.2 seconds (5.9 seconds with 1 foot of rollout like on a drag strip). It went on to pummel the quarter-mile in 14.3 seconds at 99.3 mph. Bud Lindemann’s TV series Car and Track tested the NASCAR-ready 1969 Charger 500 with the 425-hp 426 Hemi and measured its 0-60 time at 6.9 seconds. And the 440 was supposedly down 50 hp from that. So this General’s heart is pumping. We should also give some credit for the additional acceleration to the extra grip of the General Lee’s modern BF Goodrich Radial T/A tires. They measure 225/70R15 out back and 225/70R14 in front, and they’re undoubtedly the only part on the car engineered after Daisy joined the Cougar ranks. Lindemann’s 1969 mind may have perceived the Charger as a handler, but it really wasn’t. And it still isn’t. The steering is loose, the independent front torsion bar and solid axle on leaf springs rear suspension was outmoded even in 1969. It’s a car built to understeer massively and it does. On the slalom course the General Lee felt as if it were going to keel over and scrape the numbers off its doors. It managed to barge through the cones at just 56.9 mph. Considering its obstinate behavior during its skid pad orbits, the 0.74g measured there is almost shockingly good. But the brakes were even worse. Of course there’s no ABS, the front discs are tiny and the General puts 58.7 percent of its 3,699 pounds over its front wheels. So maybe the 181-foot stopping distance shouldn’t be a surprise. It’s still kind of shocking. In everyday driving (and this car will never again be a commuter), the General Lee would be plowing through the front doors of every Starbucks it passed. In every measurable dynamic, the new Charger R/T blows away the General Lee — likely to no one’s shock at all. Power brake a bit, let the wheels slip slightly with the traction control system off, and the 2011 Charger R/T gallops to 60 mph in 5.4 seconds (5.1 seconds with 1 foot of rollout like on a drag strip), with the quarter-mile consumed in 13.7 seconds at 102.8 mph. A solid performance by 21st-century standards and impressive in light of the fact that this is a porky 4,315-pound sedan that the EPA rates at 16 mpg in the city and a fine 25 mpg on the highway. Of course the rack-and-pinion steering has more feel and is much more precise than the General’s. Naturally the new Charger’s all coil-sprung, all-independent suspension is more supple than the General’s. And, naturally, its four 245/45R20 all-season Firestone Firehawk GTV tires produce superior stick. Yet the new Charger still handles like a Charger. There’s plenty of body lean and loads of understeer through the slalom and on the skid pad. With the stability control off, the 64.1-mph slalom number is sub-middling and the 0.81g generated on the skid pad is modest. An aluminum-block version of the new Hemi could knock a hundred pounds off the nose and improve things. Both the old Charger and the new one were built to chase the horizon in comfortable cruises, and both do it well. There aren’t many cars at any price that ride better than a new Charger. And there aren’t any cars that look better than a ’69 Charger at cruise. The 2011 Charger’s new interior feels high quality from door handle to shifter and steering wheel. It’s a great leap forward for Dodge, and necessary, as every other manufacturer has been improving interior quality. The General Lee’s interior, on the other hand, is dominated by a big roll bar, a lot of beige dye and loads of both wear and tear. The standards for both comfort and performance have come a long way in 42 years, and even if Bob Hartwig’s General Lee had shown as a pristine, brand-new 1969 Charger R/T 440, the 2011 edition would be the better everyday companion. But our elevated expectations of comfort and performance have also brought with it a numbing isolation. The new Charger R/T doesn’t have anything even close to the raw mechanical thrills of the General Lee. Get behind the wheel of that massive old orange car and you can feel it rock with the engine’s idle; you can hear the secondaries open on its four-barrel carburetor as you dip into the throttle and your soul jumps even before the exhaust roars. For a few moments you believe the General Lee can fly. And for a few moments there isn’t a better place to be in the world. Maybe Dodge has already figured out how to engineer that snorting edge into the upcoming 2012 Charger SRT8. But if it hasn’t, it ought to be trying. Ultimately the faster and better-handling 2011 Dodge Charger R/T is without a doubt the car you want to be in if Roscoe and Enos are on your tail. It’s also more comfortable than the General Lee, safer than the General Lee, more fuel-efficient and it has Bluetooth, satellite navigation and most importantly an iPod hookup so you can listen to your Waylon Jennings collection all day and all night. But thanks to modern-day safety regulations, emissions regulations, noise regulations, fuel economy standards, focus groups, CAD CAM designs and wind tunnel shapes, the General Lee is just cool in a way the new Charger will never be. And that is why it wins this test. “THE CAR” rises from the dead again! 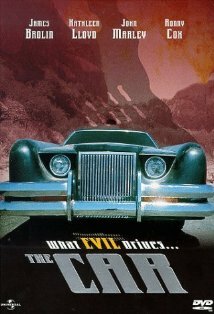 “WWED” What Would EVIL Drive? THE CAR! 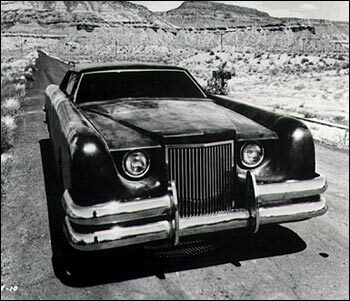 In the shadow of “JAWS” this movie was “Jaws with a car” and at the end of the movie, both original modified Lincolns were totaled. One by rolling, the other was set on fire and shot over a high cliff to it’s doom. But you can’t keep an evil car down! 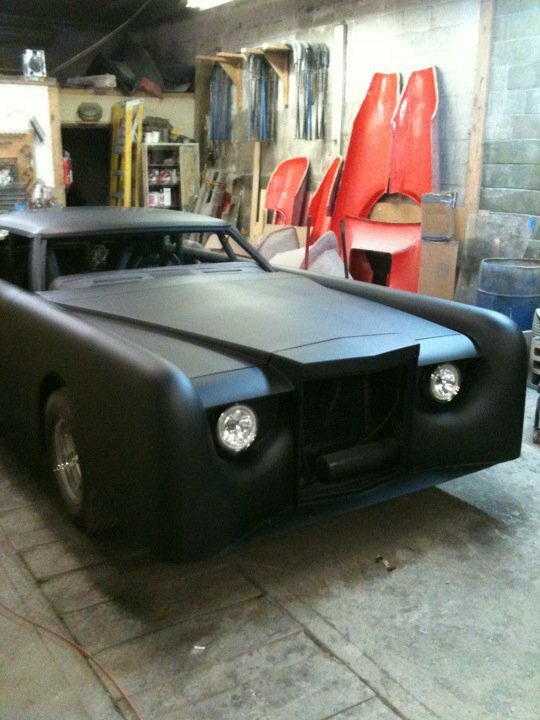 So for several years, one fan has been working to resurrect the evil Lincoln, and he’s done it! Making a full scale replica in steel is nearing completion! Now all that’s left to do is find a devil worshiping group to curse the car, and it’s ready to go! 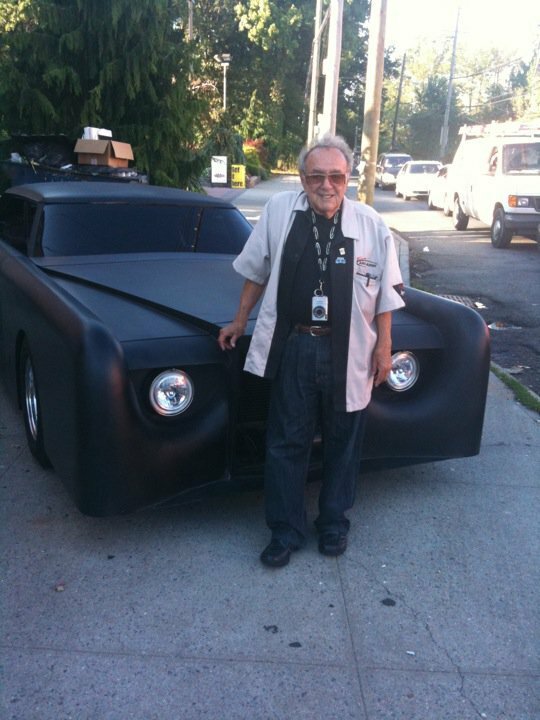 The 2 originals were built by Barris Customs for the movie, and above, George finally got reunited with this new SON of THE CAR! 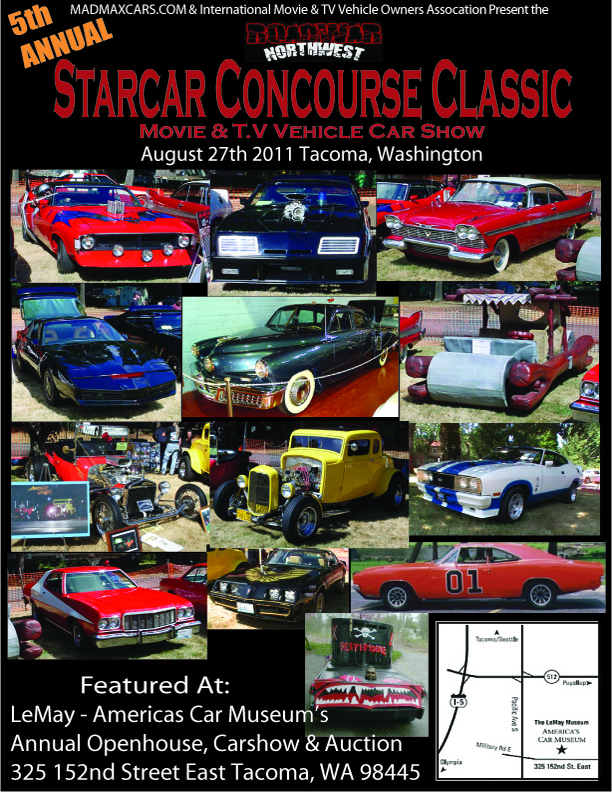 If you want a CAR of your own, thanks to a SCC honorary member – you can get a fiberglass one for your very own! You just have to sell your soul! And honk 4 times! 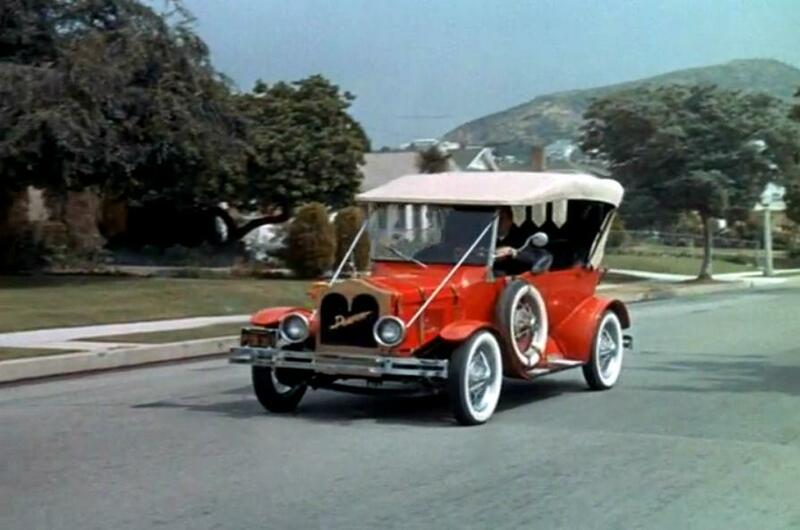 Hey, maybe this car was born from the original CAR and another famous TV car? They say girls like the bad boys! 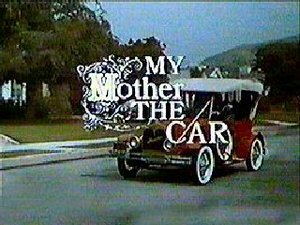 My Mother the car starred Jerry Van Dyke and one of the first cars that was the star of a show! There are at least two “1928 Porters” out there, anyone know where we can find the screen used “Mother”? At last report, there was a 1928 Porter in Alberta Canada in a private collection, and one in a museum in Tennessee, but we want one that will tour with us in Southern California! 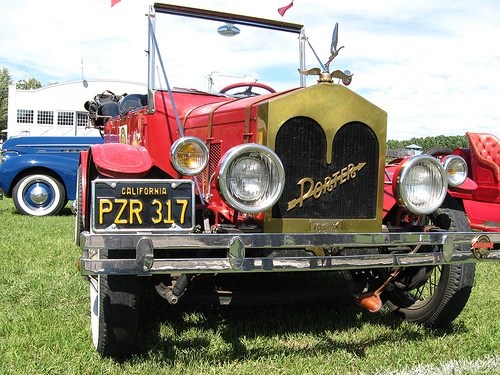 The 1928 Porter was an actual car, made from the parts of other cars from other makers! So if you do your research, you could in theory, put one together from parts of other old cars. 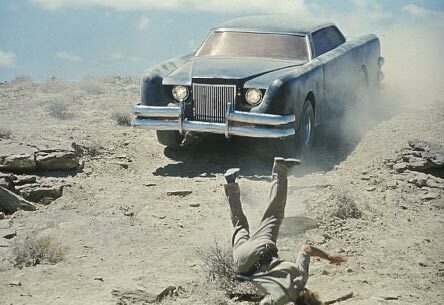 Starcar Trivia: The final death of THE CAR footage, was used to double for KITT in an episode of Knight Rider shooting off a cliff! watch it all or go to about 3:10 in to see the shot! Extra Credit starcarcentral.com points for finding 2 other famous tv cars in the photos above!